The EIA reported today that the peak underground working gas in storage capacity increased from 4.049 Tcf in April 2010 to 4.103 Tcf in April 2011, an increase of 54 Bcf. This statistic measures the highest observed storage capacity of the various storage facilities across the countries. It measures peaks that don't necessarily coincide with one another. Working gas design capacity, which is more of a theoretical estimate of storage capacity, increased by 35 Bcf, from 4.353 Tcf to 4.388 Tcf, over the same period. While the second figure is nice, put more stock in the first one that measures observed peaks. To give some reference, the current storage level (before tomorrow's announcement) is 2.906 Tcf, which is around 2% below the five year average for this week. But we are entering the fall season, in which inventories build before the heating season kicks in. 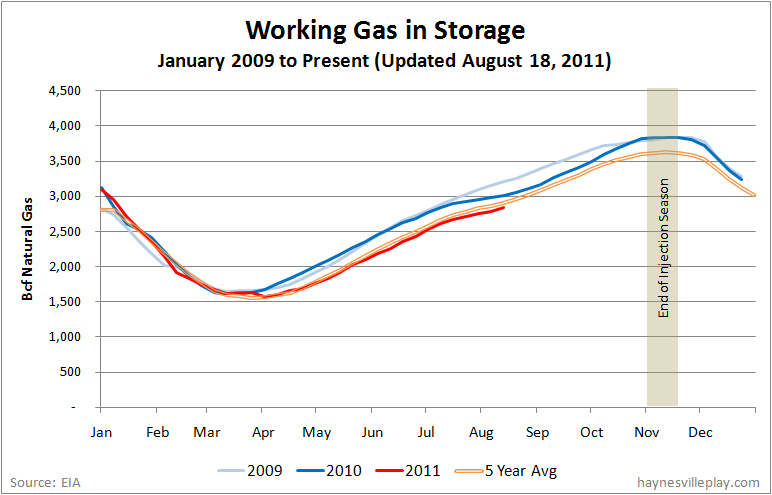 Last year, gas in storage peaked at a record high 3.84 Tcf the first week of November. Louisiana seems likely to follow Texas and enact a law requiring energy companies to disclose the chemicals used in the hydraulic fracturing process. But like Texas, the new regulations likely will have big loopholes allowing companies exclusions for trade secrets. This is a move in the right direction and is a case of the industry taking the initiative before being forced into a regulatory structure by environmentalists and angry legislators. But because the industry - via the Department of Conservation - seems to be leading the charge, the resulting regulations likely won't be terribly strong. The trade secret loophole is not unique to Louisiana, as the same language is used in Texas and Wyoming. Unfortunately, the loophole is not likely will not help build trust between the energy industry and its critics. The weekly Baker Hughes rig count showed a one rig increase in the national rig count, bringing the number of working rigs to 1,975. 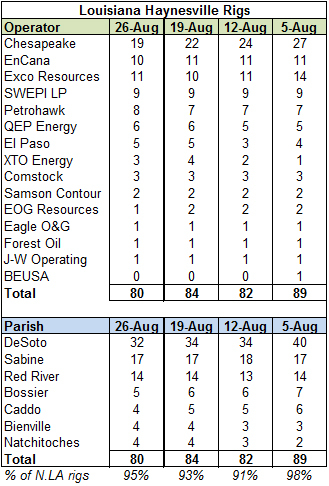 Oil rigs were up three to 1,069, gas rigs were down two to 898 and miscellaneous rigs held at eight. By type, horizontal rigs were up two to 1,140, directional rigs were up one to 228 and vertical rigs were down two to 607. In the Haynesville Shale region, inclusive of other formations, the rig count was down six to 133. 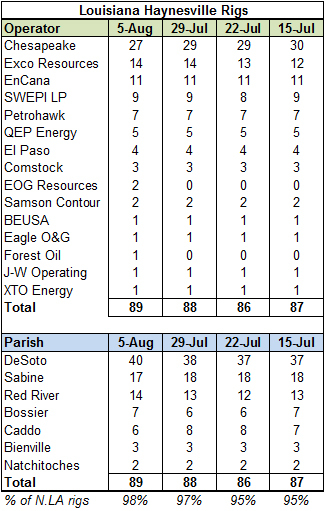 Texas rigs held at 49, while north Louisiana rigs were down six to 84. ...And I'm finally caught up. I updated my Mid-Bossier completions list (spreadsheet and map) with some data that had been reported over the past couple of months on the Louisiana and Texas completion lists but hadn't been added to the Mid-Bossier list. Rather than list the updates here, you can click the spreadsheet and see the changes in light red. Encana Corp. announced today that it will sell its holdings in the Barnett Shale. The company has retained an investment bank and will seek to close a deal at the end of 2011 or beginning of 2012. Encana has 52,000 net acres in the Barnett currently producing about 125 MMcf/day. A transaction would also include the company's pipeline and treatment facilities. Encana describes the transaction as a strategic move to offload a mature field so that it can focus on its earlier stage investments, not a sale for the purpose of generating capital. Labels: Barnett Shale, Deals, EnCana Corp. 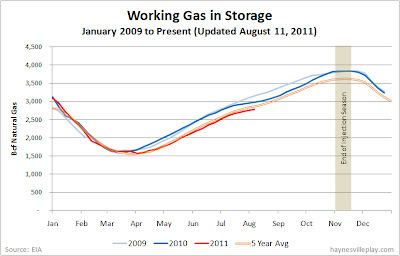 The weekly EIA working gas in storage report showed a 73 Bcf increase to 2.906 Tcf. The net injection is 92% greater than last year (+38 Bcf) and 33% greater than the five year average (+55 Bcf). The current storage level is 4.6% below last year (3.046 Tcf) and 1.9% below the five year average (2.961 Tcf). Temperatures last week averaged 74.6 degrees, 0.4 degrees warmer than normal, but 2.6 degrees below last year. The U.S. Geological Survey reported yesterday that it had revised its estimates of the resource potential of the Marcellus Shale, estimating that the formation contains 84 Tcf of undiscovered natural gas. 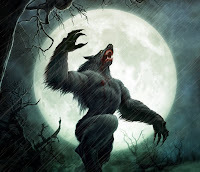 Sounds like a lot, but it is less than a third of the 285 Tcf that has been commonly used and considerably lower than the 410 Tcf to 827 Tcf that more exuberant sources have suggested. This is the first time the USGS has estimated the Marcellus since 2002, when it estimated a 2 Tcf potential. But that was before horizontal drilling and hydraulic fracturing made access to shale gas relatively easy. The USGS also estimates that there are 3.4 billion barrels of recoverable natural gas liquids (range: 1.6 to 6.2 billion barrels). Estimates change all the time, but this is a significant deviation from expectations. I expect to hear some questioning of this report by those who have invested billions in the Marcellus. No word on whether or not we should be looking for a new estimate for the Haynesville Shale anytime soon, but based on this revised estimate, the Haynesville would be by far the largest gas field in the U.S. In a staged episode at a Colorado Oil and Gas Association meeting, a Halliburton executive took a drink of the company's new brand of hydraulic fracturing fluid, CleanStim. Hopefully the frackocktail didn't include proppant, or it would have been a gritty bev. Halliburton has been pushing CleanStim as a friendlier alternative to older versions of fracking fluid. The stunt was not widely witnessed, but I doubt it will change too many negative opinions about fracking (or Halliburton). But it did give evidence that the oil and gas industry is taking tangible steps towards making the fracturing fluids out of natural products that are less scary sounding (even in minute quantities). I'm of the belief that this is a trend that will follow and that this is not the last time someone will take a swig of frack fluid. I'm almost caught up with completions updates. By the end of the week I should post this week's LA completions along with updated spreadsheets and maps. As of last week, the Haynesville Shale rig count stood at 119. This is up three from the previous week but down two from two weeks prior, when I last reported the data. Last week, the Natural Gas Subcommittee of the Secretary of Energy Advisory Board released a report commissioned by DOE Secretary Steven Chu with recommendations "to improve the safety and environmental performance of natural gas hydraulic fracturing from shale formations." (Full report; executive summary) You can read the executive summary for specifics, but the report makes level-headed suggestions about making the process of hydraulic fracturing more transparent and safe through better access to information, development of best practices and enhanced research and development. Common sense stuff. In the past few days, some non-right leaning newspaper editorials have endorsed the Subcommittee's findings. The New York Times took a well-deserved beating for its recent series on natural gas, but its editorial board takes a more measured approach to the fracking debate. The Boston Globe similarly dials back the rhetoric ("Re-thinking the fracking debate"). Yesterday, Goodrich Petroleum announced that it had received a subpoena from the New York Attorney General and the SEC. (Here is some more on the New York subpoenas.) It looks like the AG also is targeting Chesapeake Energy, Range Resources and Cabot Oil & Gas, ostensibly because the state's pension fund has $45 million invested in the four companies. I wonder how much is political pandering versus real investigation. If there is something being done wrong, it definitely needs to be revealed. If this is a politically-motivated fishing expedition, it is an unnecessary waste of time. Only time will tell which it is. The weekly Baker Hughes rig count showed a 15 rig increase to 1,974. 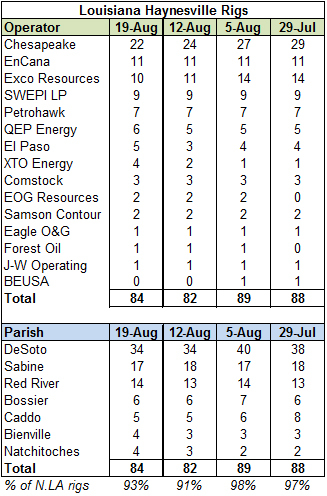 Oil rigs were up 11 to 1,066, gas rigs were up four to 900 and miscellaneous rigs held at eight. 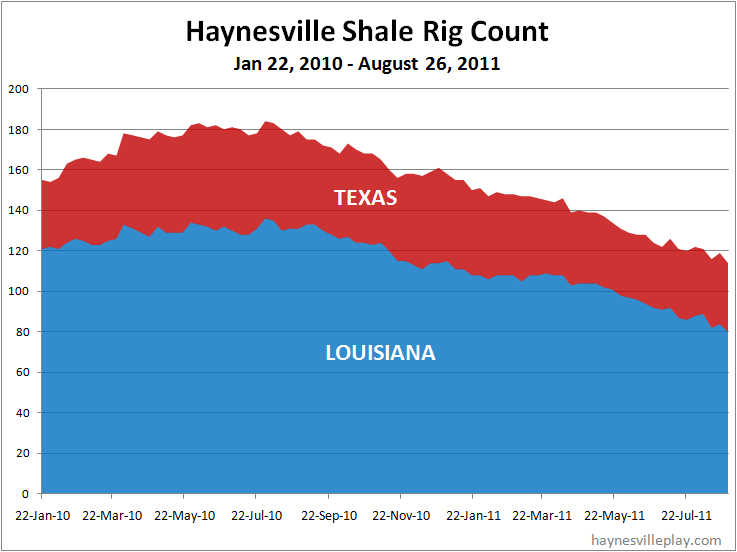 Horizontal rigs were up 15 to 1,138 and vertical rigs were up 13 to 609, while directional rigs were down 13 to 227. 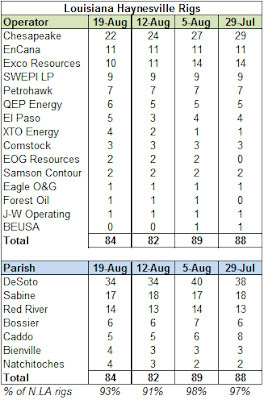 In the Haynesville Shale region, inclusive of other formations, the overall rig count was down two to 139, its lowest level since September 2009. North Louisiana held at 90, while east Texas was down two to 49. I'm working on the data for the detailed Haynesville count for the past two weeks. I hope to have something (for at least one of the weeks) later today or tomorrow. Goodrich Petroleum announced today that it has received subpoenas from the Securities and Exchange Commission and the State of New York Attorney General's office "requesting information relating to its Haynesville Shale gas wells and reserves." The company thinks the subpoenas are a result of the front page articles in the New York Times a couple of months ago, articles that I think are borderline yellow journalism. Not sure what will come of this. If Goodrich is on the receiving end of these subpoenas, expect similar announcements from other companies. Interestingly, a couple of weeks ago the Times' Public Editor Arthur Brisbane took the authors and editors of the scandalous natural gas articles to task for a second time in his weekly column in the Sunday Times (July 31, 2011). In an article entitled, "Why Redacting E-Mails Is a Bad Idea," he schooled us on the "classic problems associated with anonymous sourcing." I've been catching up on investor materials and was interested to note that GMX announced a couple of weeks ago that the company has drilled its last well in the Haynesville until the price of natural gas goes up. The company's last Haynesville well will be completed in August. With its strategic shift to chase liquids in the Rockies, the company has little use for dry gas (at this price who does???). GMX also noted that has initiated 3D seismic shots for 33 square miles for completion in 2H 2011 to better identify oil targets. The weekly EIA working gas in storage report showed a 50 Bcf increase to 2.833 Tcf. The weekly injection was 78% higher than last year (+22 Bcf) and 16% higher than the five year average (+43 Bcf). The current storage level is 5.8% below last year (3.008 Tcf) and 2.5% below the five year average (2.863 Tcf). Temperatures last week averaged 77.0 degrees, which was 2.1 degrees warmer than normal. Matador Resources, a smaller player in the Haynesville Shale, today filed for a public offering of its stock to raise $150 million to pay down debt. With this move, the number of privately held independents in the play continues to shrink. It will be interesting to get more insight into the company with the public filing of documents, starting with the S-1 Registration Statement. Labels: Deals, Haynesville Shale, Matador Production Co. The maps and spreadsheet have been updated. The weekly Baker Hughes U.S. working rig count saw a big jump this week, rising by 39 rigs to 1,959. Oil rigs increased by 24 to 1,055, gas rigs increased by 13 to 896 and miscellaneous rigs were up two to eight. By type, horizontal rigs were up 24 to 1,123 and vertical rigs were up 19 to 596, while directional rigs were down four to 240. In the Haynesville Shale region, inclusive of other formations, the rig count dropped by one to 141. North Louisiana was down one to 90 and east Texas held at 51. 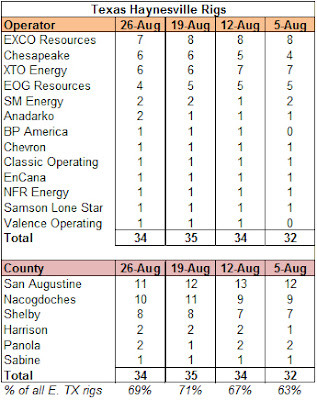 The detailed Haynesville Shale count will be delayed because the Baker Hughes individual rig data is messed up. Once it is straightened out, I'll post the detailed count. The weekly EIA working gas in storage report showed a 25 Bcf net injection, bringing the total gas in storage to 2.783 Tcf. The weekly injection was 11% lower than last year (+36 Bcf) and 12% lower than the five year average (+37 Bcf). The current storage level is 197 Bcf below last year's level (2.98 Tcf) and 80 Bcf below the five year average (2.863 Tcf). Temperatures last week averaged 79.3 degrees, which was about 4 degrees warmer than normal. Looking at the map below, you can see where the hot spot was. With the fairly low injection last week, at least there was some redeeming value from sweating our you know whats off. 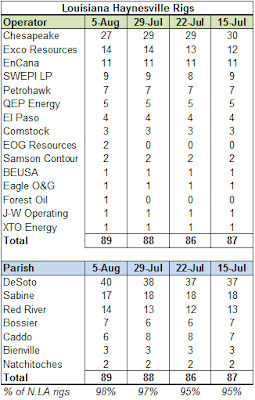 On July 22, Lake Charles Exports, LLC, an entity associated with the liquefied natural gas terminal in Lake Charles jointly owned by Southern Union and the BG Group, received approval from the U.S. Department of Energy to export natural gas to any nation with which the U.S. has a free trade agreement. It is the first step to receiving a larger export approval. 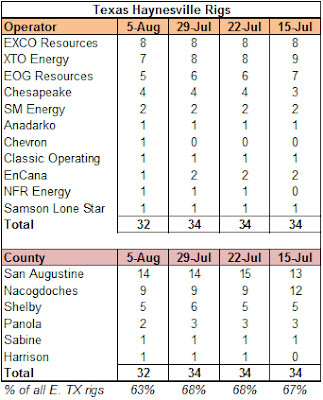 Cheniere Energy received a similar approval in September 2010, so this puts southwest Louisiana on track to have two export facilities to serve the Haynesville and Eagle Ford Shale plays in the coming years. The weekly Haynesville Shale rig count dropped by one rig to 121. The count in Louisiana was up one to 89, while the count in Texas was down two to 32. Of note, Forest Oil is back in the picture with its first well since October. The weekly Baker Hughes working rig count increased by 12 to 1,920, the highest count since November 2008. 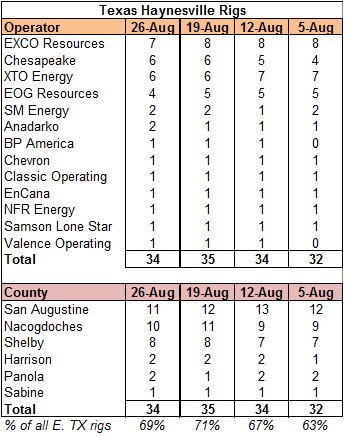 Oil rigs were up six to 1,031, gas rigs were up six to 883 and miscellaneous rigs held at six. By type, horizontal rigs were up 19 to 1,099, while vertical rigs were down five to 577 and directional rigs were down two to 244. In the Haynesville Shale region, inclusive of other formations, the count was up one to 142. North Louisiana held at 91, while east Texas was up one to 51. The detailed Haynesville count will be available later today or tomorrow, as I'm on the road. The weekly EIA working gas in storage report showed a 44 Bcf increase, bringing the U.S. gas inventories to 2.758 Tcf. The weekly injection was 52 Bcf higher than last year (+29 Bcf) and 6% lower than the five year average (+47 Bcf). It's been hot lately, but if memory serves, it was really hot this time last year too. The current storage level is 186 Bcf lower than last year (2.944 Tcf) and 68 Bcf lower than the five year average (2.826 Tcf). Temperatures last week averaged 79.4 degrees, which was 4.0 degrees warmer than normal, and 1.1 degrees warmer than last year. The market didn't much like the storage numbers this week. Even with warmer temperatures compared to last year, storage still built at a higher rate.